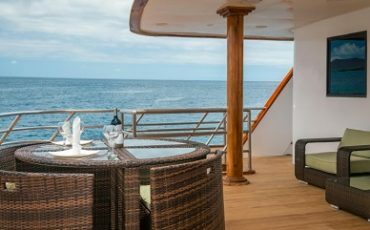 The Sea Star Journey Galapagos yacht combines a contemporary design, privacy and comfort all within the marvelous setting of the Galapagos Islands. 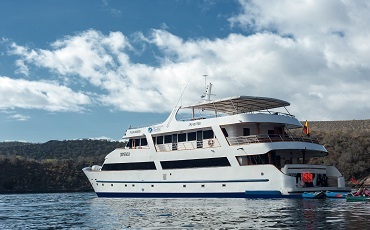 The Sea Star Journey Galapagos cruise is for up to 16 passengers, as the yacht features eight spacious Galapagos Suites (approx. 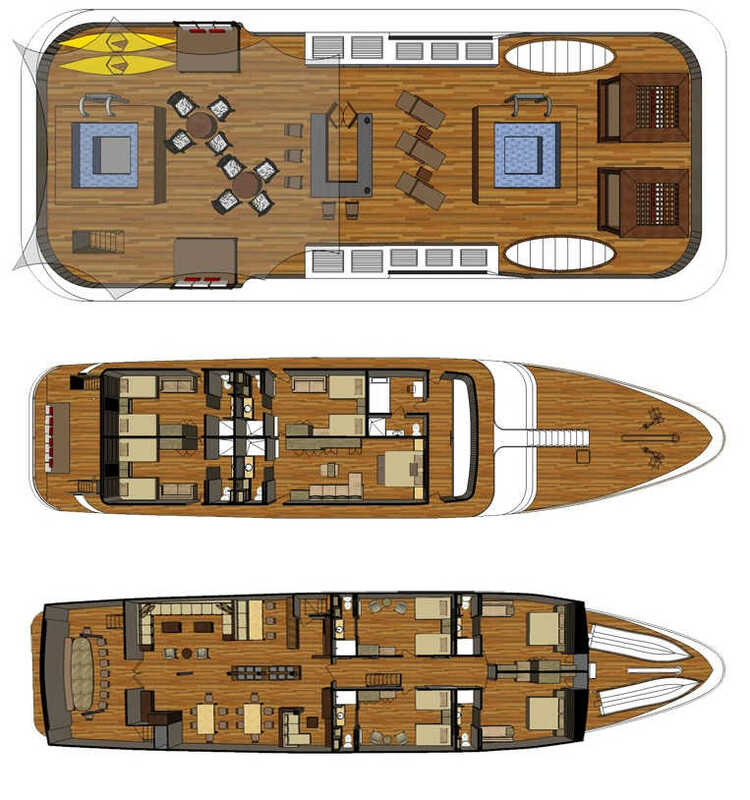 25,2 m) and the larger and even more luxurious Sea Star Suite (approx. 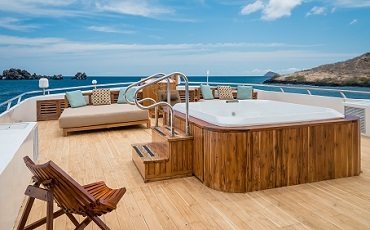 35,2 m) equipped with panoramic windows to enjoy the wonderful landscapes of the islands. 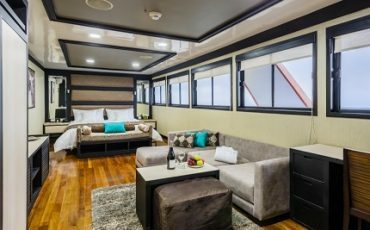 These come with a private bathroom, hot/cold water, air conditioning (with independent controls), a minibar and TV. 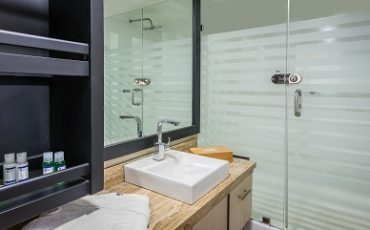 Twin beds (or one faux queen bed) and connected suites are available for families. AM: Arrival at Baltra Airport and bus ride to Puerto Ayora, escorted by a representative of Galapagos Sea Star Journey. PM: Visit to Dragon Hill in the north west of Santa Cruz and hike on a trail to a hyper-saline lagoon behind the beach where you can observe flamingos, pintail ducks and other bird species. Enjoy stunning views from the hill. AM: Visit to the Black Turtle Cove. This little lagoon is an ideal place as nursery for many sharks and rays. You may spot sea turtles, pelicans and Herons. While snorkeling you may discover large groups of white-tip reef, black tipped reef and hammerheads sharks, schools of golden rays and spotted eagle rays. PM: Visit to the small islet Chinese hat, which is a recent volcanic cone. This area is ideal for geological interpretation. 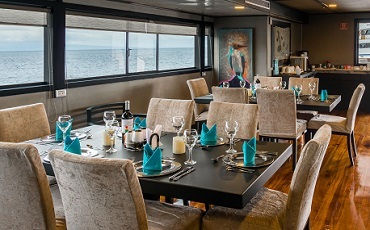 In the surrounding you can see sea lion colonies, marine iguanas and Galapagos penguins. AM: Cruise to El Barranco at Genovesa Isaland. On hikes on this ground which was formed by lava you may spot two species of nesting Storm Petrels and their main predator, the short-eared owl. On panga rides along the cliffs you can see sea lions and diverse sea birds. PM: Wet landing on the white coral sandy beach. On the hike to the cliff edge you can observe Red Footed-Booby, Masked Boobies, Wandering Tattlers, Lava Gulls, Whimbrels, Yellow-crowned and Black-crowned Lava Herons, Red-Foots, Sharp-beaked Finches, Ground Finches, Galapagos Doves, etc. Enjoy stunning views from the cliff edge. AM: Cruise to Bartholomew Island. Enjoy amazing views including to the famous and picturesque Pinnacle Rock. 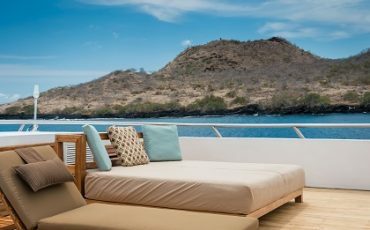 You may observe marine turtles and a small colony of Galapagos penguins at two beautiful beaches. PM: Visit to the Sullivan Bay at volcanic active Santiago Island. Along the south coast you can observe young flows and cones that characterize the island. AM: Cruise to Santa Cruz. The hike through the Highlands of this island lead through the agricultural zone the Miconia Zone, and then goes to the Fern and Sedge zone. On the hike you can observe the Giant Galapagos Tortoise closely.